Now that LeBron James is in L.A. and the shock has almost worn off, it's time to look at the roster and consider what they can complete this season. LeBron James and the Lakers are a mystery at the moment. While the thought by many is that the Lakers will punt on this season and make bigger moves next summer when players like Kawhi Leonard and Klay Thompson hit free agency, what do they have on the roster now and what can they accomplish this season? Andrew Sharp and Ben Golliver discuss on the latest episode of the Open Floor podcast. Ben Golliver: What's your best five next year for LeBron and the Lakers? And stack it up against what it would have been on the Spurs or the Sixers or the Celtics or the Rockets. 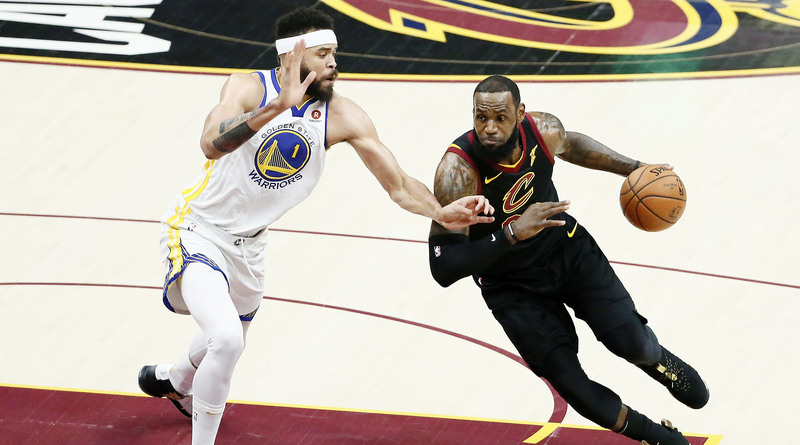 The only worse basketball fit for LeBron next year, in 2019 if he's truly committed to chasing titles and running with the Warriors, the only worse basketball fit among his options was the Cavaliers. And thankfully he didn't choose the Cavs because none of us could have watched that. I don't think he wanted to live that again. Golliver: OK, point blank, are they going to make the Western Conference finals next year? Let's bet on it. Sharp: Probably not, and I think LeBron recognized that coming in. If your question is how can LeBron win a title next year, in 2019, then the answer was go to Boston. Find a way to go to Boston, see if Danny Ainge will trade Kyrie. That wasn't appealing to LeBron, and I think it wasn't appealing because he doesn't want to do what KD did. He cares about his place in history, he cares about how all of this is perceived and the Lakers have a ton of upside, which for some reason you're not acknowleging and you're not the only one so I don't mean to single you out. Golliver: No, go ahead and single me out, because you're talking in circles. Does he care about winning? Does he care about being the man? Or does he want to be famous? It sounds to me like he's going to L.A. because he wants to be the hero, he wants to write a story, he wants to be in the center of it. And look if it works out great, if it doesn't oh well. He'll just blame how good the Warriors are and you're going to let him off the hook in a year or two if it doesn't pan out. Look, I'm saying tell me how good can this team really be, put this team together. All you're saying is he's not going to get Kyrie, he didn't get Paul George, he's not going to get Klay Thompson next summer, he doesn't want DeMarcus Cousins. OK, great, so who is he getting? Who are these playings that are magically going to put him up on that level where he's going to be able to build something that's really worth talking about on the basketball court. I'm not taking away from his decision at all. I am very excited to go to every single one of his games, media day, the circus, all of it. I'm into it, but you cannot try to pitch me on this idea that the Lakers are going to be a great basketball fit when it's him and a bunch of misfit toys right now and young, unproven players. This team is not going to be that good in the Western Conference. This is not the Eastern Conference. Sharp: Don't put words in my mouth, OK. What I'm saying is LeBron absolutely still cares about winning. He still cares about beating the Warriors. He cares about beating them on his own terms, and that's what the Lakers were selling. Golliver: He's not going to beat them on his terms. That's the lesson we've learned from the last few days. Golliver: Wait, wait, wait... Slow down, I can't even keep up. So it's going to be hard now? You just told me it's a great situation with amazing upside and all the stars are going to go there and I'm sleeping on it. Now five seconds later you're saying they've got nothing else? Sharp: I'm not being a hypocrit in any sense of the word. There's nuance to what's happening here. I don't understand why it has to be black and white. What I'm telling you is that LeBron is not suddenly punting on the basketball side just to focus on business and living in nice weather and letting his kids go to school in L.A. I think this is a really audacious move from a basketball standpoint, he's trying to build another superteam from scratch when he's older, his influence is waning and it's going to be really tough to pull off because also the Warriors are f---in' impossible. So that's a whole other issue. Golliver: You're making the excuses for him when he doesn't do it. I hear you.